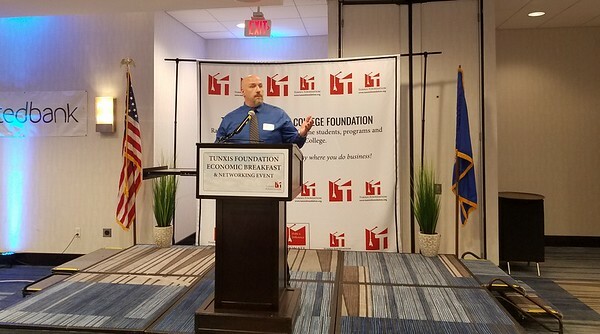 BRISTOL - Stanley Black & Decker’s chief executive officer, Jim Loree, spoke at the Tunxis Foundation Networking Breakfast on Tuesday about the economic challenges Connecticut faces and the role manufacturing can play in developing a more sustainable state economy. James Lombella, president of Tunxis Community College; members of the community; Tunxis Foundation board members, and students took part in the event at the DoubleTree by Hilton. Loree said that while Connecticut’s finances have not been growing, institutions such as Tunxis Community College and Stanley Black & Decker can play a role in providing a positive change. Loree said education is key in order to have a vibrant advanced manufacturing corps. On the other hand, Loree said, there is a significant skill shortage in Connecticut that needs intensive cooperation from both state government and local businesses. He noted that the perception of manufacturing needs to be more positive and careers in the industry need to be more desirable to those entering the workforce. Finally, Loree emphasized leadership, which he said the state needs to truly be established as a center for advanced manufacturing and business engagement. “We have significant physical challenges that are impeding our growth and hampering our success but as we all know there are so many advantages to this state - our location, the highly talented skilled workforce, the amazing arts institutions, the healthcare, the education, and just the generally extraordinary quality of life,” Loree said. The event also had a student speaker, Michael Pelletier, who has had several jobs in the manufacturing industry. Pelletier spoke about his personal experience in manufacturing and recognized the need for training even for people like himself who have spent years working in the industry but need to concentrate on learning the new digital manufacturing processes. To learn more about manufacturing programs at Tunxis visit www.tunxis.edu . Posted in The Bristol Press, Bristol, General Business on Thursday, 4 October 2018 20:26. Updated: Thursday, 4 October 2018 20:29.